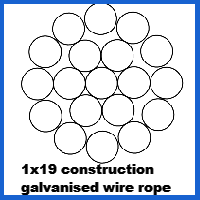 Looking for some all-purpose galvanised wire rope that is sure to stand the test of time? Our 1×19 construction rope with a 7mm diameter may be a suitable choice. 7mm 1×19 Galvanised Wire Rope should cope with a cavalcade of outdoor applications and work wonders in moist atmospheres. How is it that this wire rope manages to avoid rusting? This is all thanks to the galvanised surface, which means that the steel of the strands will not react with the environment around it as there is a coating of zinc in the way. A 7mm diameter allows this rope to provide a capacity of up to 5,140kg and an equally noteworthy 50.4kN breaking force rating. There are so many other thicknesses of this 1×19 rope available that even if this example falls short in its specifications, your choices are not limited. The strong, versatile 1×19 structure of this rope makes it suitable for lots of uses. However, some customers need a little more specialisation from their assembly. That is where our full array of ropes can really shine, giving you compelling options like plastic coated rope and non-rotating rope to really shake things up. Speak with a Rope Services Direct sales representative on the phone by calling 01384 78004 and let them give you product advice, quotes and general assistance. Contact us with an email for in-depth responses to any questions you have about wire rope. 7mm 1x19 Galvanised Wire Rope Overall rating: 5 out of 5 based on 6 reviews.